Assault Suit Leynos (重装騎兵レイノス) is a 1990 run-and-gun by NCS released in Japan and the US for the Sega Mega Drive. 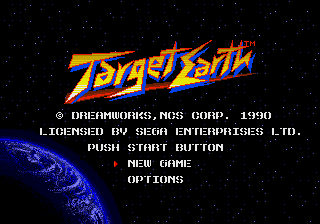 The US version was renamed Target Earth and published by DreamWorks. Outcasts from Earth sent away to the far reaches of the universe return in powerful warships and begin getting revenge, attacking both the planet and its outposts around the Solar System. The Earth Defense League sends its warriors out to retaliate; each warrior is armed with a cyborg suit that makes them powerful enough to take on the outcasts. Before each level, you are given the ability to choose which weapons to equip; switch weapons with and fire with . You can hold down for rapidfire and hold the D-pad to aim shots. jumps. A sequel was released for the Sega Saturn in 1997 and the game was spin-off into Cybernator/Assault Suit Valken on the SNES, which itself received a sequel. Neither sequel was released outside Japan. Main article: Target Earth/Magazine articles. Main article: Target Earth/Promotional material.